Premier Dental | DYK – Your fluoride varnish applications may not be working as well as they could? Home » Perspectives » DYK – Your fluoride varnish applications may not be working as well as they could? Using the current ADA Caries Risk Assessment Tools for children 0-6 and >6 years of age, individuals with evidence of previous carious lesions, new carious lesions, teeth lost due to caries, visible plaque, and the presence of orthodontic appliances are some of the reasons for a moderate-high caries risk.3,4 In these patients applications of fluoride varnish typically occur on six month intervals to coincide with a dental prophylaxis and oral exam. But is this the best way to utilize fluoride varnish to help prevent caries, white spots, and hypersensitivity? Again from the ADA Executive Summary, for people who are at an elevated risk of developing dental caries… 2.26 percent fluoride varnish [5% NaF] should be applied at least every three to six months.”1 This means that for children with moderate-high caries risk, 2-4 applications of fluoride varnish are recommended. Clinically, how should multiple fluoride varnish applications be accomplished? After a prophylaxis, each time? In practice, for a patient determined to be at a moderate or greater risk for caries they could receive the first application of fluoride varnish following prophylaxis and exam. For the next two applications, patients could simply visit the office and receive the fluoride varnish treatment without the need for a preceding hygiene procedure (in the presence of heavy deposits or debris, asking the patient to brush before varnish application may be advisable). Why should I consider Enamel Pro® 5% NaF Varnish? Fluoride varnish can be an effective tool in a caries management protocol, and maximizing the effectiveness of that tool can mean better outcomes for our patients. In addition to patient education, oral hygiene, and routine care, choosing the right fluoride treatment and using it effectively is key to maximizing clinical benefit. 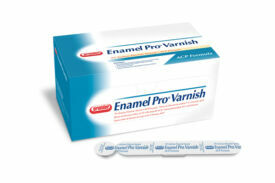 After determining the patient’s caries risk, consider Enamel Pro® Varnish at the proper interval for caries prevention. Learn more about Enamel Pro® Varnish at www.premusa.com or call 888-773-6872 to speak to a customer service representative. Acknowledgement: Clinical imagery and case examples courtesy of Dr. Shalom Mehler.